Photograph of me, Randy Ordonio, with my mother, Vee Ordonio. We made it! In my early 20s I had a fun part-time job working for a small airline, as I was putting myself through school. One huge benefit to working for an airline? You can fly almost anywhere, nearly for free! A great job when you are young, broke and ready to explore the world. As soon as my amazing flying privileges became known, my family started planning! It was exciting, discovering where the world may take me. My first major destination: The Philippines! 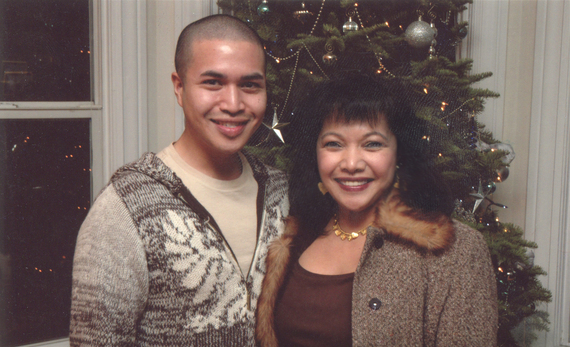 My mother had already booked a flight for herself to go to the Philippines to have a reunion with her family. I knew this would be a great time to use my benefit to fly across the world, all by myself! I was packed and ready to go. Everything I needed was placed neatly in one suitcase. I greeted my mother at the airport to send her off on her direct flight. I had a longer trip ahead of me, with a layover in Japan. I noticed my petite mother, who was standing beautifully put-together for her trip, was lugging around three monstrously enormous cardboard boxes. They were huge compared to her body. Just looking at them you could tell she had to put up a fight; stuffing everything inside, with bulging corners, high heel marks on the sides, and thick packing tape wound around each box about a thousand times! After I gawked at the cardboard monstrosities, she asked me if I could take one of her boxes on my flight. Of course I said yes. All that she would tell me about the box, was that it had extra goodies to give to our extended family. I thought, "how sweet," kissed her on the cheek, and we went on our separate ways! In order to get my discounted flights, I had to fly standby. This meant that I was squeezed into the open seats as they were available. Checking into my flight, something amazing happened. I got a free upgrade. First Class to Japan! This was the start to an amazing trip! As I nestled into my own private spacious seat, I was excited because I had never felt that catered to before. That 10-hour flight to Japan would be one of the best flights ever. Three-course meals, comfortable seating, and a private movie screen. Oh, the life! I finally arrived in Japan and I was ready to take the next flight to my destination. A customer service agent said that the flight I would be taking was overbooked, and I would have to wait until there was a flight with available space for me. Which was in two days! I was frazzled. So, I gathered my suitcase and the box, and went to a separate counter to hold my luggage. Two Japanese TSA agents with security canines followed me. Their friendly smiles turned to suspicious faces. The dog started to bark and I froze. The agents were stern and asked me to open the cardboard box. I said, "Sure!" I had nothing to hide. Out in the middle of busy foot traffic, the agents started cutting the miles of tape that my mother secured the cardboard box of "goodies" with. Finally the top flew open and the agents were surprised at what they saw. Together, they pulled out a huge package of Costco-sized muffins. I started to sweat. I whispered to myself, "Oh no! They think I'm smuggling drugs in these enormous, American-sized muffins!!!" They took the muffins away for further inspection. Then, both TSA agents looked into the box with horror. They gulped, and quickly started to put on plastic white gloves. The agents looked at each other and spoke feverishly in Japanese. Both agents crouched down, teeth-gritting and grunting, they began hoisting something out. What in the world did my mom put in this thing?! I am sure at this point I couldn't hide my anxiety. They could barely hold it between the two of them, but they pulled out what looked like a 100-pound frozen turkey! My face was burning cherry red! They could read my thoughts behind my eyes. Am I in trouble? How do I explain this to the security guards? One of them looked up at me, barely standing from the weight of the giant dripping Big-Bird in his hands. He asked, "What ... is ... this?" I looked down, and then up to him again. Had they never seen a turkey before? Was this just an American thing? Now they will think that I am definitely lying and smuggling some horrible illegal substance inside this giant bird thing. They looked at me again. Okay, I thought, I know what to say. "It's ... um ... a ... chicken!" "Yes, a very big chicken." So now I knew that they knew there was no way this gigantic chicken could actually be a chicken. We all knew it. They escorted me to a private room. I was in trouble. I was sweating like never before. For sure, they think I am smuggling something now! They were thinking, this obviously is not a chicken. Or they thought to themselves, gosh, American food is HUGE! First, the enormous Costco muffins, now the turkey-turned-chicken! They took the bird and left me alone in the room for about five minutes. A huge crowd of agents swung open the door with hysterical laughter. One agent recognized the chicken as a turkey. They all looked at me and pointed and laughed, "Oh, turkey!!!" I looked down, in embarrassment, and said, "Yes, it's a turkey. Not a chicken!" After their complete inspection, and no drugs found, I was let go in shame! I couldn't wait to get on my flight, and be on my merry way! I greeted my mother after two days of lugging around a 20-pound, now defrosted turkey, and Costco-sized muffins. My mother asked, "What happened?" "Mom, you could have told me I was bringing these oversized American foods! I was stopped by security, because of a frozen turkey!" She was so apologetic and promised never to do that again. We finally arrived to a family member's home. We unpacked and knew that we had to do something about this defrosted turkey. "We have to eat it after all that," my mother insisted! I didn't argue. I just went with it at this point. When we looked around the kitchen, we noticed the stove. It was a mini stove, almost fit for children to play and cook with! I looked at my mother with an expression that said, "oh well, this is the end for this turkey." My mother replied with, "We can still cook it!" I could not believe this! Now I had to butcher this poor defrosted turkey. Shockingly, it was still slightly frozen right in the middle. So I said, "Let's give it a go!" We gathered whatever we could in the kitchen and the garden to season it. I took the chopped up turkey pieces and I brined it, dried it, and baked the separate parts. No one got sick, and surprisingly, everyone loved their first taste of American turkey!